You know, I had an entirely different, non-seasonally-themed post in mind for this week, until I realized that next week is Halloween. Next week! October is flying by, a realization that is bittersweet for me; I love this month and this time of year, and I hate to see it all zoom by so quickly. But on the other hand, the big day is at the very end of it all, and at least in my situation, you gotta make it through most of October to get to Ghoulardifest. And then there’s Thanksgiving, and then Christmas, and on and on it all goes. I love this time of year! Anyway, with the season being in the full swing of things, I figured I may as well stick with a horror theme until the end of month (not so hard to do; barring the Tarzan post and Big Chuck & Lil’ John pre-game one, all of my recent posts are more or less seasonally-appropriate. I didn’t plan things that way, it’s just how it all worked out). 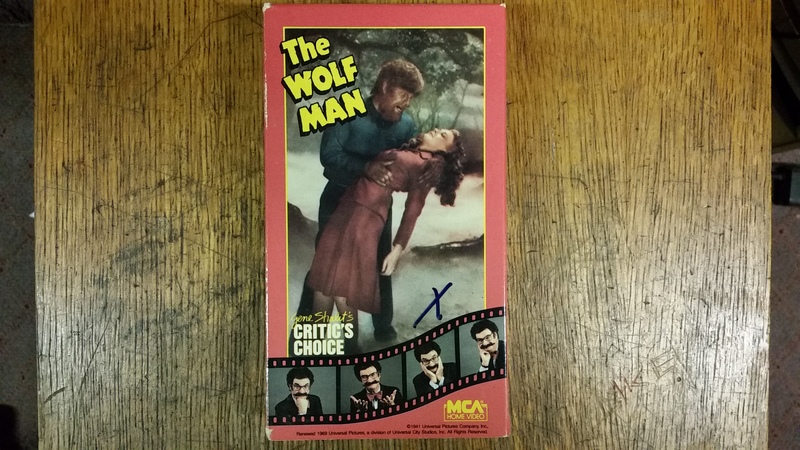 On that front, nothing screams “spirit o’ da season!” quite like Gene Shalit’s mustachioed visage plastered all over a VHS release of The Wolf Man. 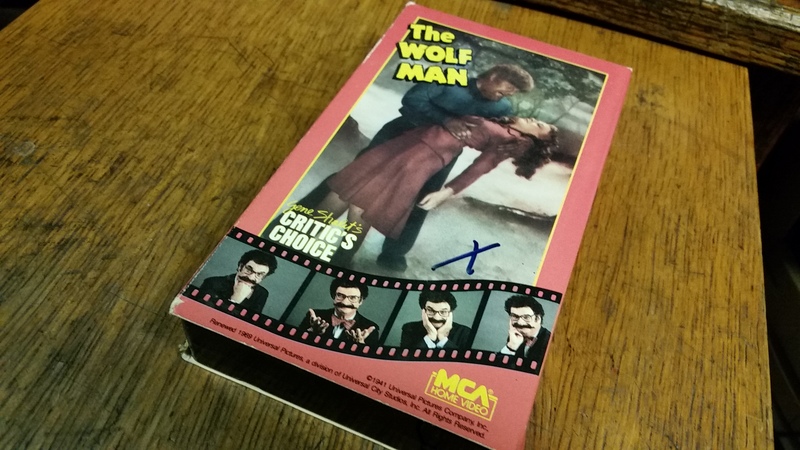 Behold: from 1987, it’s MCA Home Video’s release of 1941’s The Wolf Man, as part of their Gene Shalit’s Critic’s Choice series! It’s not a particularly rare video, it can be had on eBay for a few mere dollars, but any time Gene Shalit himself shows up out of nowhere to tell me to watch a movie, well, that’s worthy of a post. 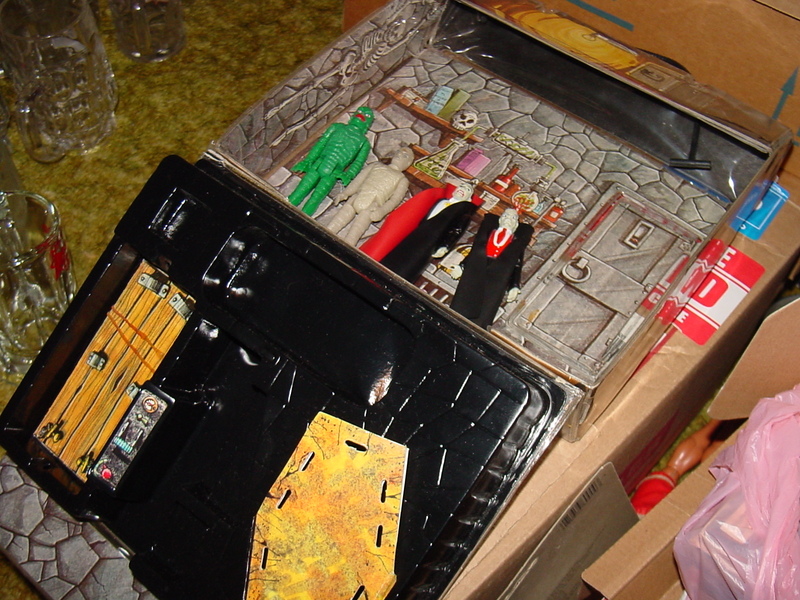 Plus, The Wolf Man, Halloween, it just fits. The movie is a classic for sure, but for this particular post, it’s really all about the cover art this time around. Yeah, we’ll take a brief look at the film itself, but seriously, the cover art makes this one. First off, you’ve got that great image regarding the movie itself: Lon Chaney Jr. as the titular character, gripping Evelyn Ankers, surrounded by fog, foreboding trees, it’s all just great. Really, you don’t need much more to sell The Wolf Man in my opinion. Later VHS releases, including one that’s an illustrated close-up of Wolfie’s face and one that used the original gol’derned poster art as a template, failed to improve upon the spooky vibes emanating from the cover art of this 1987 release. Annnnnd then, in waltzes Gene Shalit. And make no mistake, it’s all about the Shalit here. Now granted, there was a whole line of these Critic’s Choice tapes for MCA featuring him, some more befitting his image than others, but in the case of this particular entry, it’s just such an odd combination. You’ve got Gene Shalit, longtime Today Show movie critic, with his big giant mustache and even bigger bow tie, busy mugging for the camera while Lon Chaney Jr. is busy committing wolficide mere inches away. You can almost hear him making a pun. “Now that’s what I call a hairy situation!” That’s the kind of pun he used to make, right? And I love the film strip at the bottom of the cover, showing what I like to call “The Four Stages Of Gene.” From left to right, you’ve got apprehensive Gene, jokey Gene, spooked Gene, and knowledgeable Gene. It’s any kind of Gene for any kind of movie! Keep in mind, I’m not criticizing any of this, either. I’ve got nothing but respect for Gene Shalit, I think he’s a cool guy, and he was (and is) such a well-known personality that it makes perfect sense to have him pitch what are, ostensibly, his top-home video picks. But like I said before, when it comes to this particular movie, it’s just such a jarring combination. Heck, when I first stumbled upon this video, that’s precisely what attracted me to it. It’s the kind of tape that really could have only come out in the 1980s, and again, that’s not a criticism. I give ’em props for Shalit-izing the back cover, too; supposedly he himself write the synopsis, and even if he didn’t, it gives a pretty good idea of his style. Go ahead and click on the picture for a supersized version. Read that description and then tell me it’s not the greatest synopsis The Wolf Man has ever had or will have. First off: puns! Gene Shalit loved him some puns, and he gets off some good ones here. He totally makes a “hairy” gag (having only glanced at the description beforehand, I promise you my joke earlier was entirely coincidental or subconscious or some crap like that). And “…all howl breaks loose” alone is almost certainly the greatest thing ever written on the back of a Wolf Man release. This is a statement I comfortably make, despite having not read the descriptive synopsis on the back of each and every one of them. Beyond the patented Shalit style, however, is the fact that it’s just a really great description: there’s enough humor to keep it from being dry, and just enough information to make it sound interesting without giving too much away. 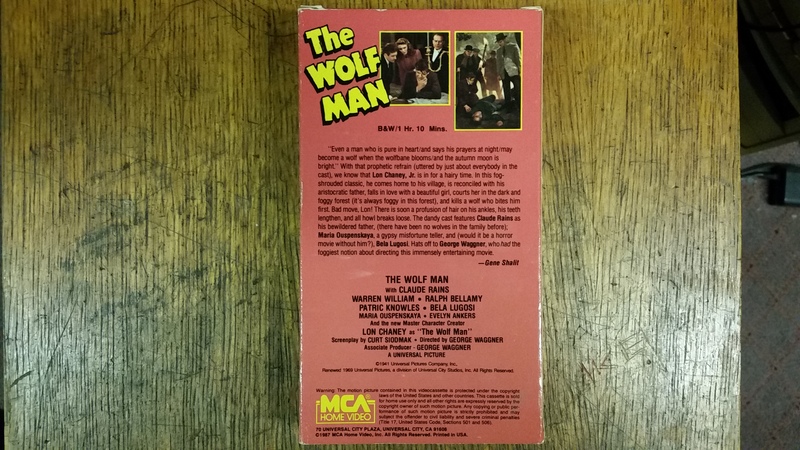 Remember, this tape came out when rental stores were the places to go for movies; while it’s hard to imagine anyone not having some idea of what The Wolf Man was about, the truth is that the description on the back of a box could and often did make the difference between what wound up being a weekend rental and what continued to languish on the shelf. The cover art (which, as I said, this release also has nailed) got the people to pick the tape up, but the description could be the swaying factor in a real, honest-to-goodness rental. Or maybe I’m just totally full of it, who knows. Why’d you write your name all over my collectible VHS tape, Lisa M.?! The absence of Gene Shalit’s name anywhere on the tape itself leads me to believe there was a ‘regular’ VHS release of this movie, and the same tapes were used both for that and this Gene Shalit-branded-sleeve version. (Come to think of it, I wonder if there’s a ranch anywhere that brands their cattle with Gene Shalit’s face. If there’s not, there should be.) But then, looking at online auctions, most of the ‘early’ releases tend to be this exact one; I’m not seeing any non-Shalit version from the time period. Maybe more people bought this one for the exact same reasons that I’m so enamored with it. Or maybe I’m just totally full of it, who knows. By the way, do you like the way I snapped the picture with Shalit overlooking the proceedings? Totally intentional, yo. I like to imagine those are the stages of his reaction to Lisa M. writing her name on the label. He starts off irritated and then learns to live with it. Seems plausible. Aw shucks. 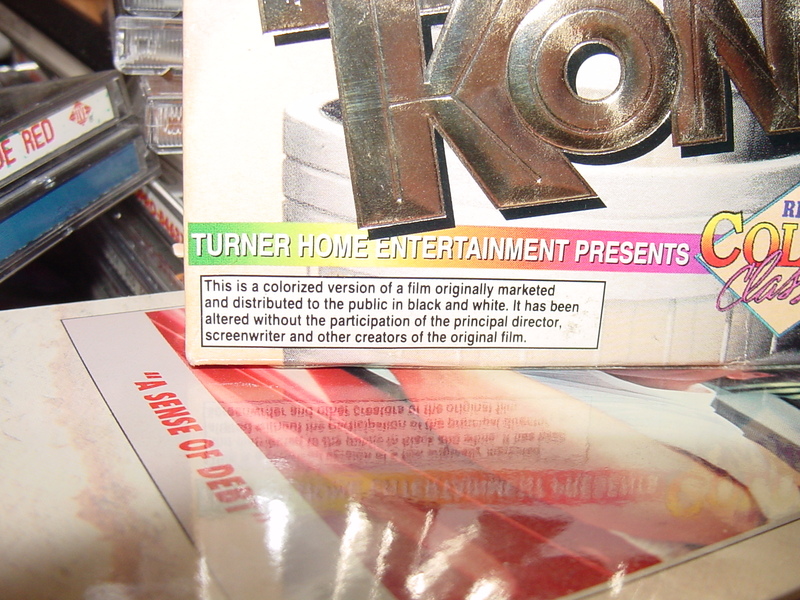 Bitter sadness: Gene Shalit appears on the VHS sleeve only. Apparently he said all he had to say about the movie on the back cover. Of course I kid. I didn’t really expect Gene Shalit to pop up on-screen and intro the movie, although the idea of his providing running commentary not unlike Mystery Science Theater 3000 just popped into my head and bizarrely amuses me. 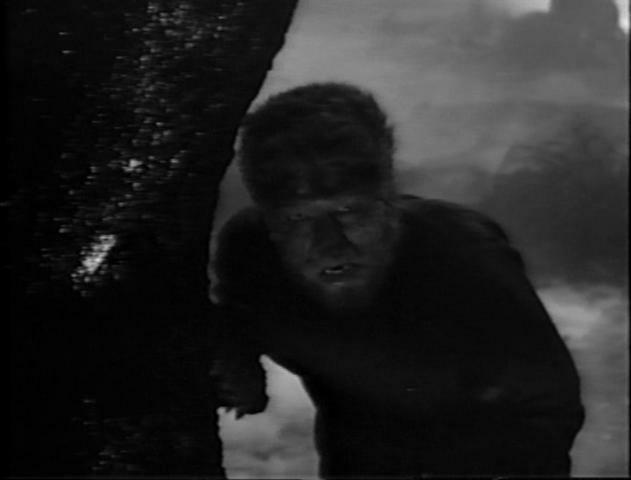 But then, The Wolf Man is a movie that doesn’t need anything extra. This is a genuine Universal horror classic! It’s a terrific, engrossing film, and coming from me, that’s a telling statement. Why’s that? Well, It may be anathema to admit this, but I’m going to come right out and say it: I’m not a big werewolf guy. Werewolf movies in general I’ve never much cared for (you probably won’t see Gene Shalit lending his mug to Fury Of The Wolfman anytime soon! ), and as far as the Universal classics go, for me personally The Wolf Man generally finds a lukewarm place somewhere in the middle. 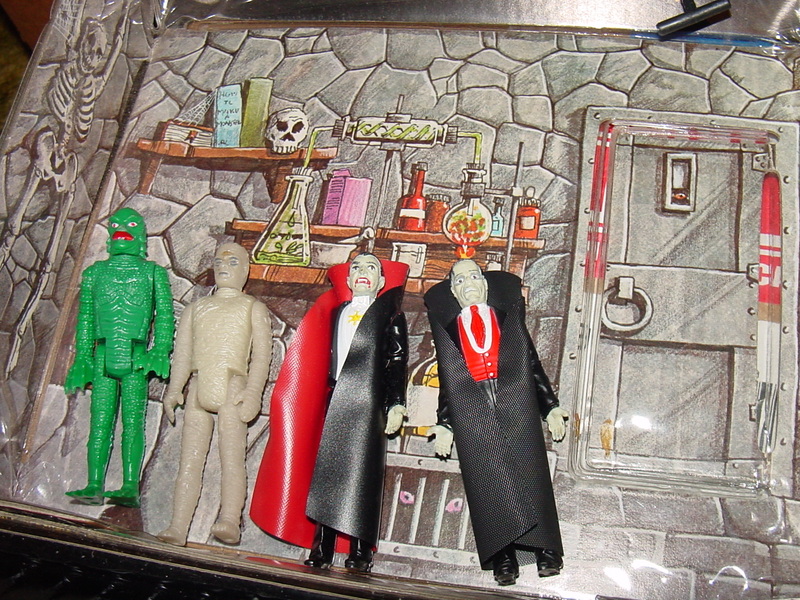 While I always liked The Wolf Man more than The Mummy, The Invisible Man and The Phantom, he’s still markedly below my favorites of Frankenstein, The Gill Man, and Dracula (in that order). 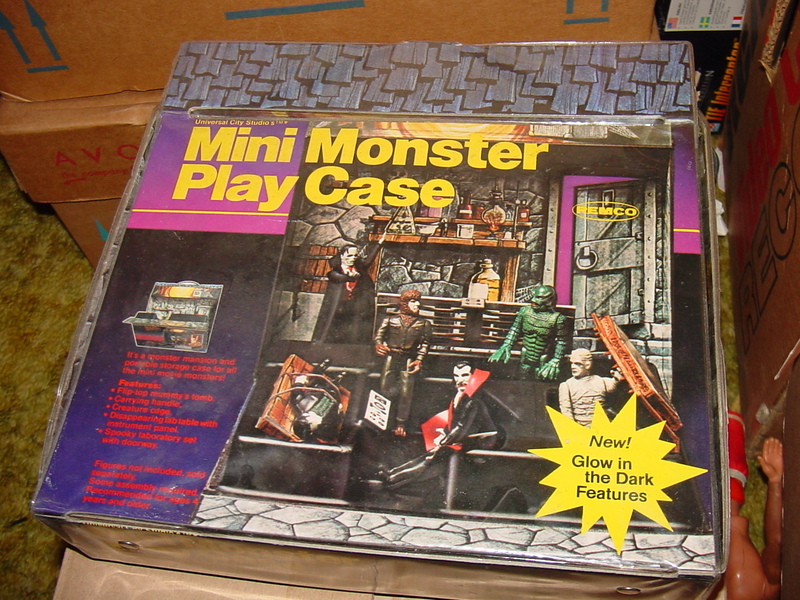 Luckily, many of those other monsters that I am more fond of appeared in the sequels to this movie. 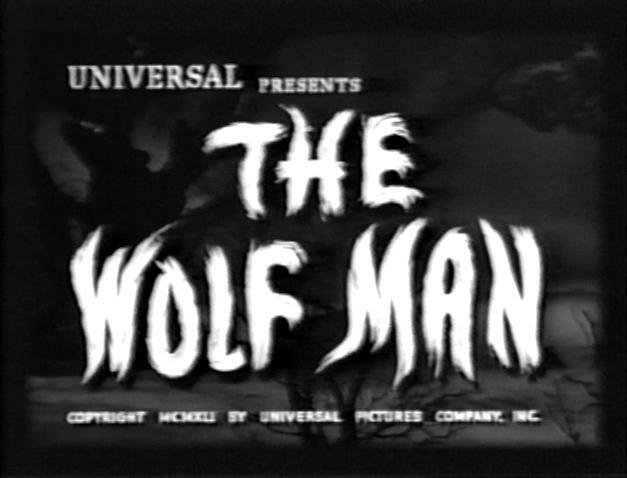 This original 1941 The Wolf Man is really the exception to all that, though. While I’m not as enamored with the character as others are, this movie is fantastic. Unlike the sequels, in which Universal apparently felt Wolfie couldn’t stand on his own, it all works wonderfully here. It’s not a movie I watch terribly often, but when I do, I enjoy it. The plot as it is may not sound too revolutionary; this sort of thing has been done over and over so many times throughout the years that some of the bite (see, I can pun too HAW HAW HAW) has been taken out of this original film, but if you can overlook that and just watch this one on its own, it’s great. Lon Chaney Jr. plays Larry Talbot, who is returning to his family home in Wales. His brother has died and he wants to make amends with his father (Claude “I is the invisible mang” Rains). One night he tangles with a wolf, which turns out to be Bela Lugosi (who somehow I totally forgot was in this movie) in the form of a wolf. Talbot is bitten, and, well, you can see where this is going. Larry is now unwittingly a werewolf (whom you can see above in the handy screencap). Look, if you haven’t seen it, just go watch it, okay? It’s a great flick. 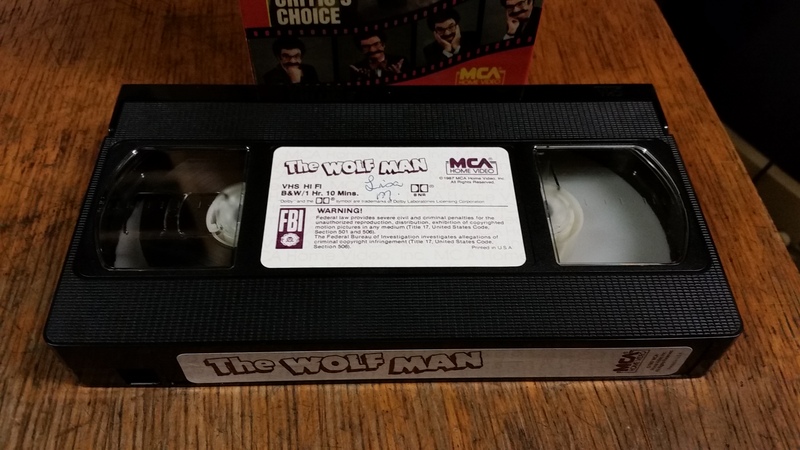 You know, I spend so much time looking at home recorded tapes or ancient budget videos that I forget how clean some movies can look on VHS, and The Wolf Man is one of them. 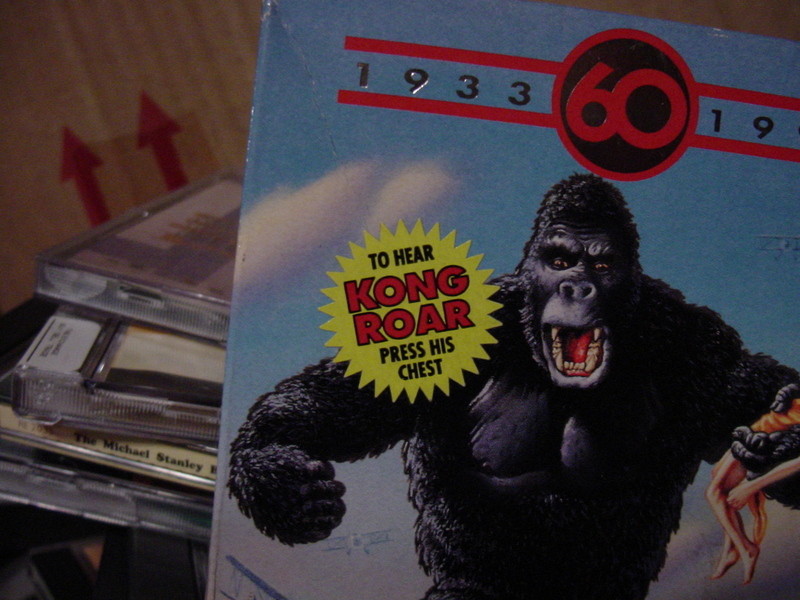 Sure, it’s an old videotape, it’s a little grainy, but it’s an officially licensed MCA/Universal tape. That is, it’s a clean, nice looking print of the movie, recorded in SP mode. It’s not a remastered DVD, I know, but compared to most of the crap I look at, it might as well be. Plus, you know, Gene Shalit on the cover and everything. I was actually pretty happy to add this one to my collection. Sure, I usually prefer my Universal monsters horror hosted (see: here and here), but there’s something to be said for (relatively) quirky older releases such as this. 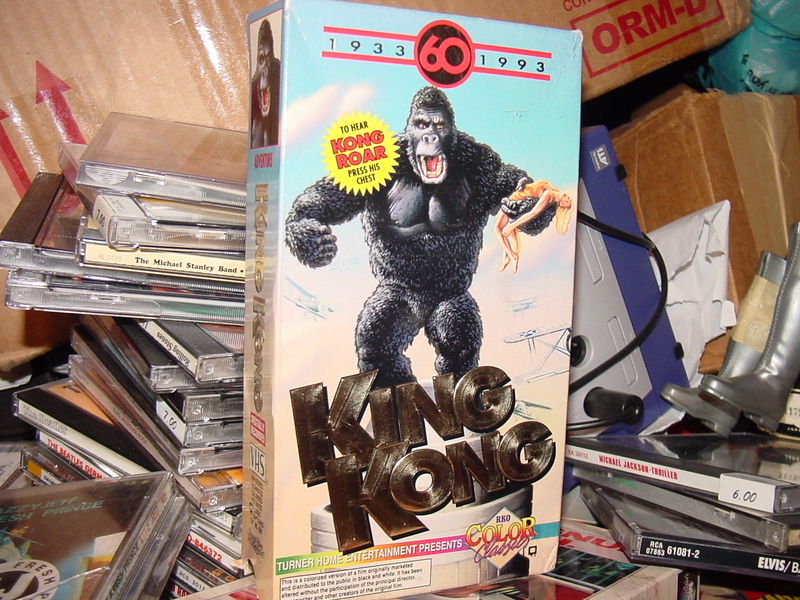 By 1987, home video, VHS in particular, was pretty well entrenched in the public consciousness, and tapes like this were what the people wanted; clean, uncut, commercial-free classic movies they could watch any time they darn well pleased. Nowadays we have the film on DVD and Blu-ray, but for a cool late-1980s/early-1990s throwback, it may not be a bad idea to bust out the ol’ VCR and fire this (or any horror flick of your choice really) up this Halloween. Something about it just seems so right. To me, anyway. Plus, Gene Shalit. I strongly feel Gene Shalit plastered all over movie covers should totally be an ongoing thing. Heck, why’d they stop at VHS? DVD, Blu-ray, digital downloads (somehow), there’s no format not worthy of the Shalit bow tie guarantee of greatness! This entry was posted in Uncategorized and tagged 1987, article, beta, betamax, blu-ray, bluray, cassette, cassette tape, classic, cover art, DVD, film, film critic, film review, gene shalit, gene shalit critic, gene shalit the wolf man, gene shalit vhs, gene shalit video, gene shalit wolf man, gene shalit wolf man vhs, gene shalit's critic's choice, halloween, horror, Horror film, horror host, horror movie, horror movie host, hosted movie, lon chaney, lon chaney jr., lon chaney junior, lon chaney wolf man, mca, mca home video, monster, movie, movie critic, movie host, movie review, old, overview, review, the today show, the today show gene shalit, the wolf man, the wolf man 1941, the wolf man 1941 review, the wolf man review, the wolf man vhs, the wolf man vhs release, universal, universal monsters, universal wolf man, vhs, vhs release, vhs sleeve, vhs version, vhs wolf man, video, videocassette, videotape, vintage, werewolf, werewolf film, werewolf movie on October 19, 2015 by neovideohunter.